You can always trust our friends over at ICON Vehicle Dynamics to deliver high-quality and high-powered suspension systems for your 2005 to 2016 Super Duty truck, and their Stage 1 2.5" Suspension Package gives your truck a huge boost in suspension performance both on and off the road. ICON's Super Duty 2.5" Stage 1 Suspension Kit may not have the tallest lift and ride height in the world, but it's awesome ICON shocks and high-quality lift springs allow your truck to tackle tough terrain and handle just about any job out there. The Stage 1 gives your Super Duty F250 or F350 4WD a nice increase in front ride height so that you can squeeze on properly-size off-road wheel and tire combinations while providing your truck with an enormous improvement in suspension performance and response. The Stage 1 Kit's suspension parts all bolt on right in place of stock and come with all their necessary hardware and instructions. The heart of ICON's suspension package and what provides your Super Duty with some extra front lift is its specialized and high-quality front lift springs. 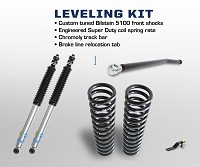 ICON's springs drop right into place of stock and adds up to 2.5" of front lift to your truck. Each ICON front lift spring features a progressive spring rate that's been finely tuned to give your F250 or F350 an extremely smooth street ride while providing excellent levels of articulation and response when head off of the beaten path. ICON also throws in a pair of alignment cams with each set of springs that allow you to bring your truck's caster back to near-OEM specs after you've installed the springs to help avoid drivability and steering issues at your truck's new ride height. Helping improve the suspension performance of your Super Duty's front and rear end and handling its new ride height is full set of ICON 2.0 Shocks. 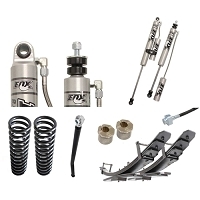 These monotube shocks feature aluminum bodies, larger pistons and rods, and carefully designed valving that greatly improves suspension response while greatly reducing fade over your Super Duty's stock front shocks. The shocks feature a 2" diameter aluminum body that allows for a large internal oil reservoir for increased performance and reduced heat buildup. The pistons have a one-piece linear/digressive design and each shot has 5/8" polished nitro-steel shafts and 6061 aluminum rod ends to help improve durability and reliability even further. The shocks come with new bushings and are drop-in replacements for your Super Duty's stock front and rear shocks. ICON Block and U-Bolt Kit: depending on your application or styling goals, you may want to grab ICON's 4" Rear Block and U-Bolts to give your truck back some front rake. Do I need to buy a separate brake line kit? Other leveling kits come with brackets to move the brake line. A brake line bracket relocation kit is not strictly required for this system, though you could potentially get an aftermarket kit if you feel like your brake lines are overly stretched or if you want to reroute them. I use my truck to plow with, will I be able to use this kit without any issues? Also do I need a different track bar or relocation bracket? According to ICON, the kit will bolt up just fine on a truck equipped with a snow plow package without any additional hardware. However, it's likely that you won't get a full 2.5" of ride height due to the extra weight from the plow package, much less the plow itself. Ships from manufacturer in 10-14 business days (Radius Arm Option 4-6 weeks) Free Shipping!